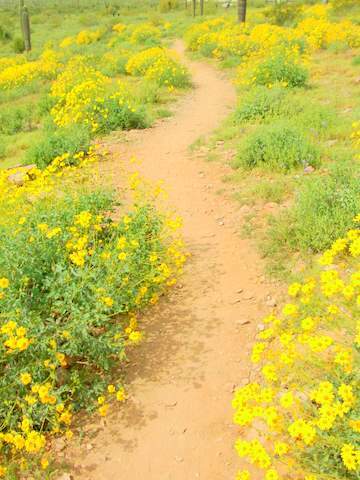 Where is a “Silly” place to see Arizona wildflowers? Arizona wildflowers come out in the spring after a “wet” winter. So where can you see wildflowers that are close to home? Right here! There are some great sites around Mesa and the SE Valley. Gas can be expensive. Time is precious. So you might as well look at wildflowers that are close to where you live. Take a spin out to Apache Junction and walk around Silly Mountain. Yes, that’s the real name. It’s in the SE Valley. There is a "silly" dirt parking lot, with a "silly" view of the Superstitions. Here’s a view from the parking lot looking north. Notice the Superstitions behind the giant Saguaros. These Saguaros have arms and that means that they are at least 65 to 75 years old! The flowers on the top of the saguaro cactus arms will bloom in the late spring to early summer. By the way, the flower of the Saguaro is the Arizona state flower. The flowers are a waxy white color and open at night. 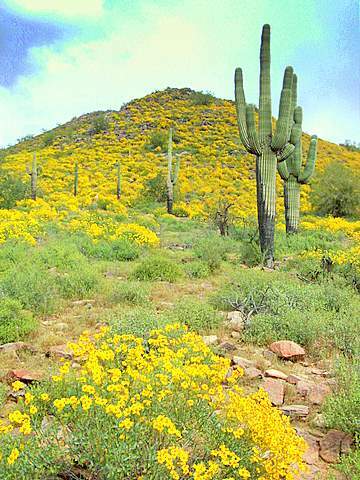 The whole top of Silly Mountain is covered with yellow flowers and Saguaros. That’s the first thing you notice from far away on the highway, the whole hill is yellow! The trails are gorgeous. 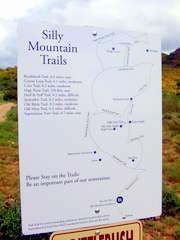 At the base of Silly Mountain is a nice map with all the trails through the AZ wildflowers that you can walk. If you look down carefully you might see some small purple flowers too. 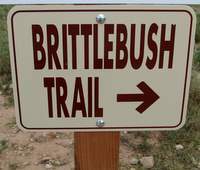 Is the Silly Mountain Brittlebush Trail easy? 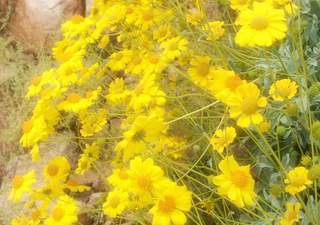 Where are some other good places to see Arizona wildflowers? If you want to see Arizona wildflowers just about all year long try the Desert Botanical Garden in Phoenix. 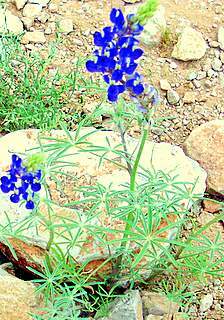 They have some unusual and spectacular wildflowers and cacti. Consider how amazing this is, flowers in the desert! Something seems to be in bloom all the time in the gardens. 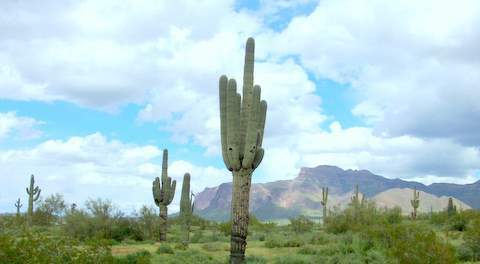 Then there is the Usery Mountain Regional Park for a wild natural setting in the Arizona desert. What's that wet fresh smell in the desert air after it rains? After the winter rains come flowers and fragrances. Ever notice that intoxicating ethereal desert perfume in the air after a rain in the dry desert? It's produced from the oils that are released from plants and flowers. Enjoy it like a sunset because it vanishes quickly. The name for this rare odor is "petrichor." The word comes from the Greek word for stone petros and ichor from the mythological veins of the gods. How do you get to Silly Mountain? You can drive up to Silly Mountain if you go east on the Superstition Freeway (US-60). Look for a hill on the north side of the road when the freeway runs out and turns into a highway. Silly Mountain and is between Mesa and Gold Canyon and the Renaissance Fair location. Watch for a road called S. Silly Mountain Road. Or just look for the cars parked next to the base.